Flea Market Classic Slot Guide & Review - Casino Answers! 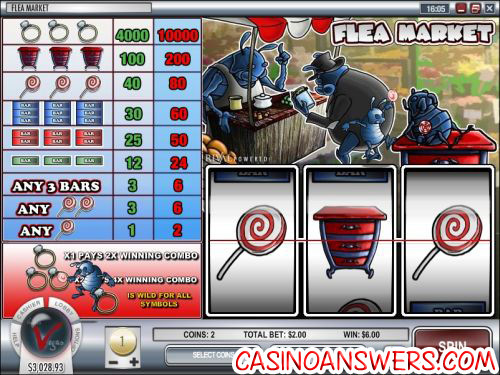 Flea Market is a 3-reel, 1-line classic slot machine developed by Rival, featuring a wild symbol and multipliers. You can play the Flea Market classic slot machine at Bovada. To play the Flea Market slot machine, all you have to do is set a coin size of $0.01, $0.05, $0.10, $0.25, $0.50, $1, $2 or $5. Once that is set, use the “Select Coins” button to select 1 or 2 coins per spin, or use “Bet Max” to bet 2 coins. There is more value in making 2-coin bets than 1-coin, due to the large top jackpot. The lowest total bet you can make on a spin in Flea Market is $0.01 with the highest total bet being $10. There is an autoplay mode for real money players only. To play Flea Market with your own wagering settings, use the “Spin” button. Flea Market has an impressive 10,000 coin top jackpot that you can win by hitting three Ring symbols on the center payline (on a 2-coin bet). The Ring symbol is wild and will substitute for all other symbols in the game. It also acts as a multiplier; one Ring symbols will act as a 2X multiplier, two Ring symbols will act as a 4X multiplier. It is easily the most valuable symbol in the slot game. You can win big with the Ring symbol at Bovada! Payouts on the Flea Market slot machine are as follows: 1 Lollipop symbol (1/2), 2 Lollipop symbols (3/6), any 3 Bar symbols (3/6), 3 Single Bar symbols (12/24), 3 Double Bar symbols (25/50), 3 Triple Bar symbols (30/60), 3 Lollipop symbols (40/80), 3 Dresser symbols (100/200) and 3 Ring symbols (4000/10,000). In total, there are 9 winning combinations. Flea Market is an excellent classic slot machine for three reasons – it has a very nice top jackpot, a wild symbol and up to a 4X multiplier. To play the Flea Market slot machine from Rival, check out Bovada. Are players based in the United States able to play the Flea Market slot machine? Can I play the Flea Market Flash game for free? Yes, you can find an Instant Play Flash version of the Flea Market slot machine at This Is Vegas Casino. If you experience issues with the Flash slot game, you might have to install the latest version of Adobe Flash Player. Is there a progressive jackpot on the Flea Market slot machine? Although there is no progressive jackpot on the Flea Market slot, you can win up to $50,000 if you make a $10 total bet and hit the top jackpot (3 Ring symbols) on a spin. For Rival progressive jackpot slots, please read our One Million Reels BC Progressive Jackpot Slot Review and Strike Gold Progressive Jackpot Slot Review. Flee Market Classic Slot? What rival casinos have the flea market slot machine?